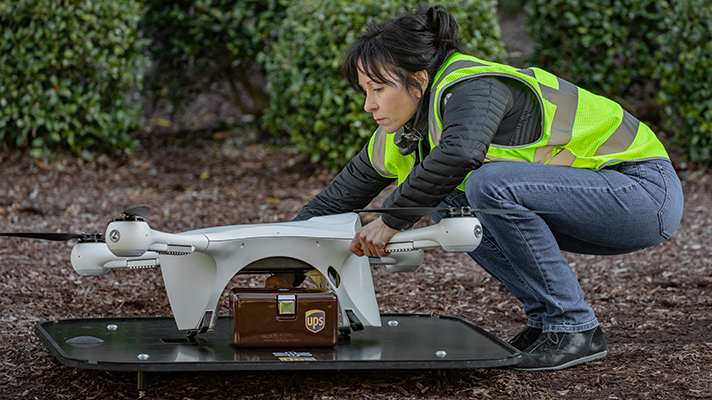 Delivery service UPS has teamed up with drone logistics specialist Matternet on medical sample delivery service at WakeMed’s hospital and campus in Raleigh, North Carolina. Drone transport has the potential to improve speed of deliveries at a lower cost and enhance access to care, with the aim of creating healthier communities. A July 2018 report by innovation foundation Nesta studied the possible drone transportation of light medical deliveries between hospitals in the UK’s capital, concluding the increased speed and reliability could cut costs and improve patient care. But barriers include the need for air traffic control systems to allow drones to operate at scale without interfering with each other or traditional aircraft. In the wake of Hurricane Maria, in September of 2018, AT&T teamed up with Merck and others to deliver medications to remote villages in Puerto Rico using drones. Those involved temperature-controlled cargo cases and medicine for ashtma and hypertension that did not need to be refrigerated. A year earlier, drones delivering automated external defibrillators reached heart attack victims as much as 17 minutes faster than emergency medical services teams in a small research program conducted in Sweden. Medical professionals will load a secure drone container with a medical sample or specimen at one of WakeMed’s nearby facilities. The drone will fly along a predetermined flight path, monitored by a remote pilot-in-command (RPIC), to a fixed landing pad at WakeMed’s main hospital and central pathology lab. The Federal Aviation Administration (FAA) and North Carolina Department of Transportation (NCDOT) will oversee the planned daily flights, which will utilize Matternet’s M2 quadcopter. The M2 is powered by a rechargeable lithium-ion battery, and can carry medical payloads weighing up to about 5 lbs. over distances of up to 12.5 miles. The NCDOT supported Matternet in conducting first-round test flights using the company’s drone technology on WakeMed’s campus in August 2018 as part of an FAA pilot program — the Matternet team had previously completed more than 3,000 flights for healthcare systems in Switzerland. “Using drones to bring blood and other diagnostic specimens from medical facilities to central labs will improve transport efficiencies like never before,” said Chris Cassidy, UPS president of global healthcare and life sciences strategy, in a statement. Matternet CEO Andreas Raptopoulos added that the goal is to shift the status quo for on-demand logistics for healthcare systems in the U.S. through drone delivery networks.